The Bose QuietComfort 35 is an awesome over-ear noise-cancelling headphone that may just be the best in its class when it comes to noise-cancelling. 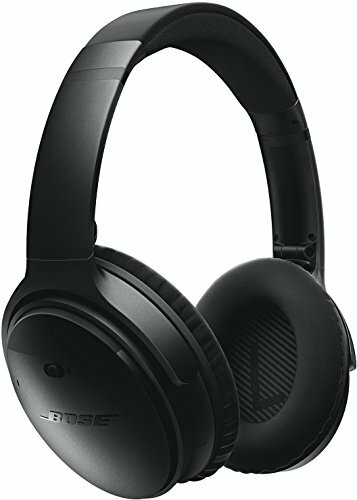 The Bose QuietComfort noise-cancelling headphones have received positive reviews for their good sound reproduction, the great noise-cancellation, their very comfortable design and their ability to take clear phone calls. Users also found that they have a very strong and reliable Bluetooth signal. Some users were a bit annoyed with the inability to turn of noise-cancellation, suggesting that it could be nice to have that feature built in. One user also found that although the overall sound is great, it did lack some bass. The Bose QuietComfort 35 noise-cancelling headphone is definitely a solid a performer, if not the best in its class. This is the Bose product a lot of people have been waiting for, the QuietComfort 35, an active noise cancelling headphone that's also wireless.